1. 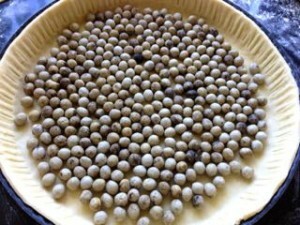 Make shortcrust pastry, roll it out thinly, lift it into a 30cm tart tin, and bake it. 2. Make a thick vanilla-flavoured custard (crème pâtissière), pour it onto the cooked pastry case and let it set. 3. Cut strawberries in half and place them neatly over the set custard. Rub the butter into the flour using just the tips of your fingers. Add just enough cold water to turn the mixture into a ball of pastry dough. Roll out the dough with a rolling pin, as thinly as possible, on a cool floured surface. Make sure the pastry is at least 3cm wider than the pastry tin. Lift it into the tin. Cut off the leftover pastry with a knife and press a fork around the edges. Check that the base is cooked, and leave to cool. Mix egg yolks, sugar and flour in a bowl. Gradually pour the warmed milk into the egg mixture, stirring all the time. Pour the custard back into the saucepan and bring it slowly to the boil until the mixture starts to thicken. Add vanilla + a pinch of salt and continue stirring for about a minute. Turn off the heat, wait a few seconds, and then pour the custard into the pastry case. Cut 750g of strawberries in half, or quarters if very large, and place neatly over the crème pâtissière, starting from the outside of the tin and moving in circles into the middle. Heat 2 tablespoons of fruit jelly/jam (Blackberry jelly is great) with 1 teaspoon of water, and brush over all the strawberries with a pastry brush. Follow the recipe for tarte aux fraises but use 2lbs of fresh plums instead of strawberries. Cut the plums in half, take out the stones, and place them flesh down onto a heavy-based non-stick pan. Sprinkle them with lots of caster or granulated sugar. Bake until the skins of the plums look/taste quite caramelised. Slide each of the plums carefully onto the custard trying to keep the plums whole and with their skins on top. 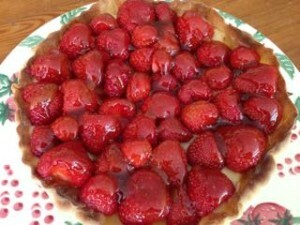 Another absolutely delicious variation on Tarte aux Fraises! This time lightly butter two baking trays. Slice about 6/7 apples (thinly but not too thinly) and lay them on the trays. Peel them off the trays and put them on the crème pâtissière. Brush on a sugary glaze like the one in the strawberry tart recipe above. Bought from a good French pâtisserie, these pastries are quite expensive, a really lovely treat, beautifully made with care and precision. Much cheaper versions are available in large supermarkets, but they never look or taste quite as special.